In the previous Citizen Media Business Issues post, we took a look at Web statistics as a means to learn more about your site and the people who visit it. Now that you know how many visitors you have, what they look at, what sites are linking to you, and so on, the question becomes: how can one increase the performance in one or more of those areas? This post is not about how to falsely inflate one metric or another. Nor is it about how to get traffic unscrupulously. Itâ€™s about how to use the tools available on the Web effectively, to accurately reflect the hard work you put in. There is no substitute for high-quality, well-presented content, but people need to be able to find it. There are several measuring sticks you can place next to your website to compare it with the rest of the Internet. A lot of people choose not to worry about such rankings, and their importance does certainly depend on your own personal goals. However, on this business side of things, which this series concerns, they matter. First of all, they can provide good tools for goal-setting and motivation, and can sometimes act as a reward for a job well done, thereby facilitating the continued production of good content. Second, marketers will often use them to gauge how much your advertising real estate is worth. You can have thousands of hits a day, but if, for whatever reason, youâ€™re not popping up in a Google search, the rate you get for advertising wonâ€™t reflect its true worth. Finally, and perhaps most importantly, knowing the inner workings of the various rankings will allow you to utilize them to their full potential, thus attracting more traffic. Before we take a closer look at individual traffic rankings, itâ€™s worth mentioning how much of an impact social news sites can have on them. Webmasters will often notice a seemingly random spike in traffic over the course of a couple days that ends up being due to incoming links from a site like Digg, Reddit, NewsVine, Fark, Slashdot, and StumbleUpon. And a sharp increase in traffic will, of course, result in improved traffic rankings. While each of these sites functions differently, they are all based on a community of users who share stories they find on the Web. The submitted links are then augmented with conversational tools and/or some form of voting system, allowing the most popular articles to rise in visibility and accessibility. A lot of people use these sites as news filters, relying on the wisdom of crowds to save browsing time by going first to those sites recommended by the rest of the community. The way most people promote their content on these sites is by placing one or more of the site-specific icons near each of their headlines or blog posts. The best known example of this is probably the â€œDigg Thisâ€� button, which registers a positive vote (known as a Digg) for the article when clicked and displays how many Diggs it has received to-date. Itâ€™s tempting to use a lot of these to enable readers to use their social news site-of-choice, but make sure to display them tastefully, avoiding messy icon spam. One way to do this is to use something like the Share This widget youâ€™ll see at the bottom of this post. When clicked, it expands into a neat menu of possible services. You may also consider getting involved in one or more of these communities. Signing up with one just because itâ€™s the biggest or prettiest isnâ€™t always the best idea. Take a survey first of whatâ€™s available (thereâ€™s a good list over at Dosh Dosh) to find where content like yours is featured prominently. For example, if you run a technology blog a la Engadget, you would probably fit in better at Slashdot than Newsvine. As a new member, you may find that the things you submit donâ€™t seem to get as much attention as something similar submitted by another user. This is because, as a community, there are often reputational gauges of member contribution (â€œkarmaâ€� on Reddit, for example) as well as personal relationships that develop among the most frequent users. As time goes on and you get more and more involved, you may find a greater number of your submissions doing well for these reasons. Alexa Internetâ€™s rankings are very simple. Every time a page on your site is viewed by someone who has their browser equipped with the Alexa toolbar, a hit is registered. It assigns rankings based on those hits (pageviews) and on â€œreachâ€� (the percentage of all Internet users who have visited the site in question), averaged over the previous three months. Despite the controversy, Alexa rankings are important to many advertisers and are at least accurate enough to be meaningful. In spite of the myriad â€œ## ways to boost your Alexa rankâ€� blog posts around the Web, there is no easy way to improve your standings. Alexa Product Manager Geoffrey Mack dispelled most of the rumors a while ago between a post on the Alexa Web Discovery Machine (an official company blog) and a comment on the Online Money Making blog. All you can really do to increase your performance hereâ€”other than attract more traffic via other meansâ€”is to encourage your loyal readers to install the toolbar, perhaps displaying a widget as a reminder. If youâ€™re not listed on Alexa, you can either simply visit your site with the Alexa toolbar installed or submit it here. If youâ€™ve looked at the data for how visitors get to your site, youâ€™ve probably noticed that a lot of people find you through search engines. The major engines, led by Google, drive a massive amount of Web traffic these days. Most people have a few favorite sites that they visit regularly by typing the familiar URL into the address bar or clicking a bookmark, but odds are good that search engines are your gateway to most of the rest of the Web. Search engines work by crawling, indexing, and then using that index to serve Web data in response to usersâ€™ search queries. A â€œcrawlerâ€� is a program that periodically visits many millions of pages, gathering data about their text, text location, headings, and so on. It essentially tries to figure out what each page is all about. That data is then â€œindexed,â€� or stored in a searchable database. So the first thing to note here is that the search engines have to know about your site in order to crawl it. To inform them of your existence, follow these links: submit to Google, submit to Yahoo!, submit to MSN Live Search, and if you have a blog, submit to Technorati. When you search for something, the engine will look at its huge index and return a list of results in order of relevance. Through your own common practice you probably know the importance of this search result ordering. In what percentage of searches do you actually get past the first few results? For most people, itâ€™s rare, and even rarer to see more than the first couple pages. None of the big engines make public exactly how they organize and prioritize search results. Google, for example, uses over 200 factors to determine which sites in its index are most relevant to the search query, and according to the New York Times, â€œmakes about a half-dozen major and minor changes a week to the vast nest of mathematical formulas that power the search engine.â€� Publicizing all of those factors would make the system too easy to manipulate and duplicate. Not all of these signals are unknown, though. Some are disclosed by the company, many are common sense to the Web savvy, and a few have been determined via trial and error and data studies. Examples include the weighting of titles and headings over other content, location of search terms on the page, how close the words in the search string are to each other, and so on. If you perform a Google search for â€œmuffinsâ€� youâ€™re going to get millions of hits. To some extent, the results will be based on relevance. But how does Google know if you are looking for recipes, a definition, the name of a restaurant, or a YouTube video with that name? Search engines then have to apply a sort of â€œimportanceâ€� factor. The idea is that, with equal relevance, a very popular site will probably satisfy a userâ€™s request more often than an unknown. These importance rankings tend to be what advertisers care about most. The main reason for this is that performing searches to see where in the results pages a particular site appears for a variety of applicable keywords just isnâ€™t practical. Rankings are quantifiable, more static, and simple values that have a significant enough relationship with traffic and search result priority to merit a direct relationship with advertising dollars. The simplest algorithm is Technoratiâ€™s Authority system. For every blog that has linked to you (and also pings Technorati) in the last six months, your authority increases by one. It doesnâ€™t matter if they link to you once or a hundred times, one blog equals one authority point. When searching with Technorati, users can choose to filter search results based on authority (for example, only including those with high scores). Authority is also displayed in the form of Technorati Rank, which is just a list of blogs arranged by authority (the number 1 ranked blog has the most authority). PageRank is Googleâ€™s way of quantifying the importance of a site within the link structure of the Web. Generally speaking, the more a page is linked to, the higher its â€œimportance,â€� and thus the higher its position in the search results. On top of that, incoming links from sites that are themselves considered important carry more weight than links from less important sites. A link to you from nytimes.com, for example, will count more than a link from somewhere on Geocities. The raw PageRank value is equal to the likelihood that someone randomly clicking on links anywhere on the Web will end up on the page (with a 15% chance of a truly random link). But you wonâ€™t see this raw value published anywhere; instead you can find a score between 0 and 10 for any site you visit with the Google Toolbar. The higher the number, the more important the site. A common misconception is that PageRank determines search result order. Actually, itâ€™s just a weight (albeit a seemingly heavy one), acting as just one of the aforementioned 200+ signals. If you donâ€™t want to install the Google Toolbar, a number of sites have programs that will find a siteâ€™s PageRank. One is SEOmozâ€™s rank checker, part of its SEO Toolbox. SEO is the process of trying to improve the amount or quality of search engine traffic. Itâ€™s become a big part of Internet marketing as businesses have found that a place at the top of organic search results is far more effective than most any advertising they could buyâ€”and unless you pay an individual or SEO firm to do it for you, itâ€™s free. â€œOrganic search resultsâ€� means those that arenâ€™t advertisements or otherwise sponsored results. Some of the main areas of SEO concentration are keywords, code, and design/presentation. After a little explanation of keywords, weâ€™ll give some examples of the other two. Letâ€™s say you run a blog called The Bread Zone thatâ€™s all about sandwiches: where to get the best peanut butter and jelly, personal recipes, history, and so on. Now put yourself in the position of a potential reader/customer. What would you search for to find the information on your site? Certainly not â€œThe Bread Zone.â€� Itâ€™s nice if youâ€™re at the top of a search for your blogâ€™s name, but if somebody knows the name of your site and is searching for it, it doesnâ€™t matter all that much where in the listings you are. The idea here is to associate your site with certain words or phrases so that if someone does a search for, say, â€œbest sandwiches Bostonâ€� or â€œElvisâ€™s sandwichâ€�, youâ€™ll be near the top. The more your keywords are used, and the more prominent they are (i.e. in titles and headings), the more likely a search engine will be to associate them with your site. Keyword associations evolve naturally, based on the sorts of things you write about. If you write a lot about the best sandwiches in Boston, you wonâ€™t be able to help Google automatically considering you more relevant for searches containing related terms. The first thing you can do to let search engines know what sorts of words will be relevant to your site is to put them in your meta keywords tag. Unfortunately, while meta keywords used to be vital, their importance been severely weakened in response to rampant abuse by people using misleading information or entering a huge number of keywords (a tactic called â€œstuffingâ€�). â€œKeyword optimizationâ€� involves careful use and placement of the chosen keywords, aggressively pushing the associations. If you decide to attempt this, keep your writing organic! Be very careful not to get involved with practices that improve search results at the expense of content quality. It will backfire. Shoehorning â€œElvisâ€™s sandwichâ€� into a bunch of titles, headings, text, links, templates, and captions without duplicating the rest of the content may be in line with what the search engines look for, so you might see a temporary boost in traffic, but then it will collapse. First your audience will fade because nobody will want to look at or read such poorly-composed text. Then because all the search engines have some sort of measure to catch this manipulative practice (another form of â€œkeyword stuffingâ€�), they will devalue your URL if not remove it from the index completely. Even if youâ€™ll be stopping at setting your meta tags, spend a little while really thinking about what words and phrases you anticipate using often anyway. Go as specific as possible, as long as itâ€™s something you can see yourself writing a lot. Remember that crawlers donâ€™t actually read English, so using the keyword â€œastrophysics,â€� even if itâ€™s an accurate representation of the siteâ€™s content, is meaningless if the word itself doesnâ€™t appear in the text. Also, â€œsandwich, bread, blogâ€� isnâ€™t going to help you a whole lot either. Even if they pop up often in your articles, those are such generic terms that youâ€™ll be lucky to appear on page 10. For an easy way to track how often you use potential keywords use the Webconfs Keyword Density Checker. It will display a word cloud, count how many times you use each, and calculate keyword density (keyword occurrence/total words, not including stop words like â€œtheâ€� or â€œandâ€�). The ideal density for each keyword is somewhere between 1% and 6%. Once you have some keyword ideas, you can throw them into Googleâ€™s Keyword Tool to analyze how often people search using those keywords, as well as some more specific alternatives. SEOChat has one of the better articles out there about Choosing and Researching Keywords. Itâ€™s several years old, but still highly relevant. Look at the top of your browser window. Right now it probably says either â€œCenter for Citizen Media: Blogâ€� or â€œCenter for Citizen Media: Blog Â» Blog Archive Â» Citizen Media Business Issues: Traffic Rankings, Search Engines, and Optimization:â€� (perhaps abbreviated), followed by the name of your browser. This is the title, and every single page on the web has one. Titles, because they are by nature relevant to the pageâ€™s content, are a big deal to search engines. Try to use a different, appropriate title for each page you create. Many blog hosts will do this automatically. A good format is to use the name of your site for the main page, and then on other pages use something like â€œ[name of your site] â€“ [name of specific page or post]â€�. Search engines donâ€™t see pictures. Not even Google Image Search sees them in the way humans do. It looks at the surrounding text and page content, the name of the picture file, and the “alt” attribute (see below for an explanation of this), but it has no way to see the graphic and understand its contents. Many blog and web hostsâ€™ uploading programs will rename the files you upload to some random combination of letters and numbers, so you may not have total control over that, but itâ€™s easy to use alt attributes effectively. â€œAltâ€� is what would be displayed in place of the image if you were using a text-only browser. It is also what users of screen readers would hear (software for the blind that speaks aloud the words on a page). In some browsers, when the title attribute is missing (not to be confused with the title of the page), it is also what pops up when you hover your cursor over an image. Also, donâ€™t use alt text that is redundant to adjacent article text. And itâ€™s probably best not to use alt tags for graphics that are purely for decoration (frilly borders and such), as they donâ€™t actually provide anything relevant to the primary content. The easiest way to create a sitemap is to use XML-Sitemaps.com. Just enter your URL, wait for it to scan, download the file, and place it in the root folder of your website (so that its address is www.yoursite.com/sitemap.xml). If you use a blog that doesnâ€™t let you upload files like this, the next best option is to use your RSS feed as a sitemap (usually www.yoursite.com/rss.xml). where [sitemap_location] is the complete URL of your sitemap. This is the only way certain search engines, like MSN, will find it. For more information about robots.txt, see the Web Robots Pages. To add your sitemap to Google, just sign up for Google Webmaster Tools and click â€œaddâ€� under the Sitemap column. If your site is located at www.yourdomain.com, a redirect is required to make sure people can get to you when they type yourdomain.com (omitting the www) into their address bar. Your domain registrar has probably already set this up for you, but check with them to make sure this is a â€œ301 redirect.â€� This tells search engines that the redirect is permanent, not temporary. A fast way to find out which type of redirect you have is to use the SEOmoz HTTP status code checker. Search engines are not smart enough to be able to see HTML frames as part of a single page. So when analyzed separately, each is weaker. The main content frame has fewer links and the navigation frame (assuming a clichÃ© frames layout) will more than likely be discounted altogether for consisting only of links. Frames made with CSS are better, because you can do it without creating separate files. Search engines have duplicate content filters so as not to serve the end user a bunch of identical results, and also to prevent someone from copying and pasting good text from a popular site like Wikipedia onto a dummy page where it is passed off as original content in order to bring in ad money. Therefore donâ€™t repost articles, avoid overusing boilerplates, etc. Avoiding duplicate content doesnâ€™t apply to navigation. In fact, having a good navigation system is very helpful as it creates a dense web of internal links, which makes it easier for the crawler to find all of your files. A crawler might not find something that requires several clicks to access. Search engines want to serve the highest quality, most relevant results to users. Since links are such a huge factor when determining search results, there are many ways in which yours can help or hurt you. Fix broken links. If you use DreamWeaver or FrontPage, you can check for them from inside the program. If not, you can use a tool like Webmaster Toolkitâ€™s Link Checker or iWebTool Broken Link Checker to scan for them. Donâ€™t link to bad neighborhoods (spammers, abusers of search engines, sites that install malwareâ€¦use common sense). Inbound links from such sites wonâ€™t hurt you, though, since you are assumed not to have control over it and they wonâ€™t affect a userâ€™s experience on your page. Watch the number of outbound links on a given page and try to stay under 100. More than that and you may trigger a link spam filter (more on link spam in the Warnings section below). When you create a link on your page, you typically donâ€™t display the full URL in your article. A link to the Wikipedia article on frogs, for example, will usually look more like <a href=”http://en.wikipedia.org/wiki/Frog”frog than http://en.wikipedia.org/wiki/Frog. These words that you show the reader to describe the link, which at the same time hide the unattractive URL, are called anchor text. Anchor text is very important to search engines because itâ€™s often very relevant to the page it refers to. The more often Wikipediaâ€™s frog page is referred to as â€œfrog,â€� the more search engines associate that particular page with that word. Knowing that, what do you think happens when someone links to you using nondescript text like â€œthis post,â€� â€œhere,â€� â€œa section,â€� or â€œgreat articleâ€�? Unfortunately, it doesnâ€™t mean that when somebody Googles â€œgreat article,â€� your page will come up. These terms are much too widely used, and arenâ€™t informative so the anchor text ends up meaning nothing. So use relevant anchor text whenever you can, especially for your own content. Be consistent, too. Use exact titles or the same keywords when linking to your other articles. However, going out of your way to shoehorn detailed anchor text for every outbound link isnâ€™t always practical. It can cause some awkward sentences and take up more space than you want, but rewording whenever you can is good practice. Google Webmaster Tools will allow you to view the most common words in anchor text linking to you. Submit your site to the Open Directory Project and the Yahoo! Directory. These are not search engines and optimization isnâ€™t a factor here, but many people use these human-organized and edited databases. Also, the data is used to generate search engine results, especially the Yahoo! Directory, which is drawn from for every Yahoo! search. They donâ€™t accept everybody, but if your content is unique or very good, and if you pick the right category to add it to, you have a good chance. Spamdexing means to manipulate search results in a way thatâ€™s not in line with the way the search engine is supposed to work. At the beginning of this post there was a disclaimer that the information contained herein would not be concerned with unscrupulous forms of search engine optimization. Here weâ€™ll detail a few of the most common such tricks. These are not just dishonest; theyâ€™re unsound and will backfire. Google, et al, know about these scams and have been tweaking defenses against them for years. Most of these are now detectable automatically via the crawler, in which case the offending site will be significantly devalued. In more drastic instances, the site will be removed permanently from the index. The few of these that do work still violate the search enginesâ€™ terms of service and, if reported or manually caught, will result in similar disciplinary action. In 2006, head of Googleâ€™s webspam group Matt Cutts confirmed on his blog, for the first time, a companyâ€™s removal from Googleâ€™s index: â€œGoogle has removed traffic-power.com and domains promoted by Traffic Power from our index because of search engine optimization techniques that violated our webmaster guidelines at http://www.google.com/webmasters/guidelines.html.â€� Companies had been removed before, but this was the first noted by name. The impetus for the disclosure was to support the defendants in a defamation lawsuit filed by Traffic Power against its critics. Banning not just Traffic Power, but also its clients makes it clear that Google has no qualms about squashing sites that use shady SEO practices, intentional or not. According to Google, you are held responsible for SEO violations relating to your site, whether implemented by you or by an SEO professional youâ€™ve hired. So these warnings are not only for those with flexible ethics. There are many well-meaning webmasters that can accidentally fall into these traps, unaware that they are doing something wrong or raising a red flag. Note: If you have been wrongly removed from Google, there is a reinclusion process you can go through. However, it can take some time to get your page restored to the search results. As we know, links matter when determining a siteâ€™s importance and relevance. Link spamming is creating links without merit. One form this takes is that of a link farm, a community of web pages that all link to each other in order to boost search engine presence. Similar is a link train, which acts like a sort of web-based pyramid scheme in which you place your link at the bottom of a list, publish it, and get other people to do the same. Some people will create multiple websites themselves just to link back and forth and boost the primary site. Others will place links in the comments of dozens or hundreds of blogs, often irrelevant or without reading the post itself. A little less common, but still disallowed, is the practice of paying for links at a popular site to be displayed in such a way that they donâ€™t look like advertisements. Only use a few in the meta tag, and for everything else allow only whatever comes from natural writing. These are all tactics people use to hide link spam or keyword stuffing, attempting to get the SEO benefit without looking sloppy. 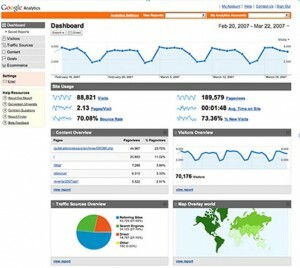 HubSpotâ€™s Website Grader is one of the most complete free SEO and marketing statistic tools on the Web. Just type in a URL, and after a few moments itâ€™ll spit out a detailed report covering everything from PageRank and Technorati rank to recommendations for how to improve your use of metadata. If youâ€™re looking for a simpler tool that will display the number of backlinks and pages indexed by the big three engines, use the Webconfs Domain Stats tool. If you want to learn more about the variables search engines look for, SEOmoz put out a really valuable article in which they compiled the responses from 37 SEO professionals about the importance of many factors. SEOTools has a couple useful Firefox add-ons called SEO for Firefox and Rank Checker. SEO for Firefox, when enabled, supplements a normal Google search with a heap of data underneath each hit. The idea is that it allows you to figure out why a page is ranked where it is. Thereâ€™s nothing here that you donâ€™t get from HubSpotâ€™s Website Grader, but it can be useful to have the information displayed right under search results. Rank Checker can automate periodic keyword analysis. For example, find out where a particular page ranks on any of the three major engines for one or a number of keywords. Then store the information so you can see how it has changed over time. If all this is a bit much, but your website is important enough to you that you would like it to be optimized, Google put together a guide to hiring a professional SEO. How many people are reading what youâ€™re writing? Who are they? How did they find you? If applicable, how likely are they to click an ad or buy a t-shirt? And without negatively affecting the usersâ€™ experience, how can you attract more visitors or increase the probability that theyâ€™ll click the ad or buy the t-shirt? For the final three Citizen Media Business Issues posts, weâ€™ll try to answer these questions by exploring Web statistics, traffic rankings, search engines, and optimization (for search engines as well as for other goals). Often referred to as analytics, Web statistics are various measures of website activity intended to help the webmaster or marketer. Webmasters use the information to attract more visitors and improve overall user experience. Marketers use it to maximize revenue and determine the value of ad space. While companies have been providing and/or selling analytics software and services since the mid-90s, the average webmaster without a budget for such things had to, for a long time, settle for the once-ubiquitous odometer-styled hit counter. The simple, public measure of how many times files were accessed since the counterâ€™s creation, aside from being a little tacky, was too unreliable and subject to manipulation by those seeking to misrepresent their traffic data. Counters just didnâ€™t do a good enough job of explaining what really happens on a site. Even if you found a free piece of real analytics software, you needed a good amount of technical savvy and access to you siteâ€™s server to get it going and maintain it. Google Analytics has brought statistics to the Web mainstream, providing a free service that requires no downloads and very little effort. All you have to do is copy and paste a little snippet of code into each of your pages (or just the template, if youâ€™re using one). Google Analyticsâ€™s metrics and features with which you can analyze them will likely be more than what you need (like which ISP your visitors are using most), but letâ€™s take a look at how to use it so you can figure out which stats are most important to you. The default tab, the Dashboard, contains the information youâ€™ll most regularly want to check. Itâ€™s customizable, so you can click the little X in the corner of each box to remove it and the sections in other tabs all have an â€œAdd to Dashboardâ€� button at the top. The first two things to note, because they apply to every Analytics page, are the date range and the graph. The date range (top right corner) is, of course, the period of time that the statistics reflect, and you can cover as much or as little time as you want by playing with it. The graph displays a measure of a particular spec over the selected date range (number of visits, by default, on the Dashboard). The drop down in the top-right corner of the graph allows you to change what it is that youâ€™re measuring. The rest of the data can be roughly explained in four groups: how many visitors you have, who they are, what they do on your site, and where they came from. How many, which includes stats like the numbers of visits and pageviews, is, of course, the most definitive measure of how popular your site is and often the primary motivator to use this software to begin with. A visit is logged any time someone starts a new session on your site, with pageviews counting all pages loaded within that session. To Google, a â€œsessionâ€� times out after 30 minutes of inactivity. If you visit, leave, and come back within 30 minutes, it will likely be counted as a single visit. Likewise, if you idle for 30 minutes and then click a link to another page on the same site, youâ€™ll probably be starting a new visit/session on the new page. 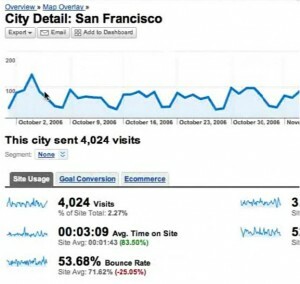 Many webmasters want to know who their visitors are in order to improve user experience. Google tracks geographic data, browser types, operating systems, ISPs, connection speeds, percentage of users with Flash or Java installed, and the number that have been to your site before. If, for example, you find that half of the people looking at your page use Internet Explorer on dial-up connections, you probably wouldnâ€™t want to require use of a FireFox plug-in or use a lot of large files like videos or high-resolution images. Information relating to what people do on your site includes amount of time spent on site, average pageviews, and bounce rate (a term that refers to the percentage of visitors who left the page they arrived on without checking out any others). Unfortunately, due to tabbed browsing, idle time, session timeouts, and wildly varying personal browsing habits, itâ€™s hard to get a lot of meaning from the average logged amount of time on site/length of visit, but weâ€™ll talk about some of its possible uses in comparisons later. Also, average pageviews, bounce rate, and depth of visit are really only useful to you if youâ€™re not running a blog or news site. Blogs are almost invariably set up to display many articles on one page and the news sites that donâ€™t use blogs still make use of scannable headlines, placing a good deal of content on the front page. What reason would someone have, then, to explore other pages? A useful what people do stat is under the Content tab, where you can see a break-down of how popular each of your pages is in terms of pageviews. With this you can assess where your strengths and weaknesses are, perhaps spot a problem if something should be higher or lower (a mistyped link, for example), or figure out what sort of content the search engines most closely associate with your site (more on this in the next post). If your goal is to get more traffic, then the most valuable data for you here probably has to do with where visitors come from, which can be found under the Traffic Sources tab. â€œWhereâ€� in this case doesnâ€™t refer to geographical location, but how people find you on the Internet. Most people probably donâ€™t type your URL into their address bar, but those that do are counted as â€œdirect traffic,â€� as are those who have it bookmarked in their browser and access your pages that way. High direct traffic is usually the result of offline marketing (business cards, print ads, etc. ), an extremely accessible/memorable URL, or high reader loyalty. Traffic that isnâ€™t â€œdirect,â€� then, must have come from some other point on the Web. The Referring Sites section displays not only the names of pages that link to you and how many of your hits came from there, but also the trends of each group of referred users. So you can see how the average pageviews, time on site, or bounce rate differs between users who clicked in from stumbleupon.com and those who found you through your friendâ€™s blogroll. The only search engine you will probably see on the list is Google Images. Search engines have their own section (not sure why Google Images isnâ€™t included there). By taking a close look at your referring sites, you can tell why people are linking to you (theyâ€™re probably linking to particular pages or topics), how relevant the referral was (a visitor from Site A may spend twice as long and look at twice as many pages as Site B), learn your strengths and weaknesses, and gain feedback about what youâ€™re writing (though rarely criticismâ€”that usually just shows up as a lack of hits unless youâ€™re sufficiently polemic). The last major part of where users come from is your search engine data, including keywords. The next post will cover all things search engine in detail. Google Analytics is a fantastic tool that can really help you improve your site (or at least provide you with some fun trivia about your readers), but the major thing itâ€™s missing is data about RSS subscriptions. Many if not most regularly-updated sites have RSS feeds these days. If you run a blog via any popular weblog software, in fact, you definitely have one. Unless youâ€™re hiding it, odds are that a significant percentage of your visitors get your content that way. So if you have an RSS feed and want the same kinds of information about it that you now have for regular Web traffic, head over to FeedBurner. FeedBurner was recently acquired by Google, so may be integrated into Analytics soon, but for now itâ€™s the best place to get statistics and add features to your feed. The service works by replacing your current RSS or Atom feed, directing visitors to subscribe to your FeedBurner feed instead. The end userâ€™s experience doesnâ€™t change unless FBâ€™s compatibility tweaks makes the content more readable or you add features. The two main RSS stats of note are subscribers and reach. Subscribers are a measure of how many people used their RSS reader to check in to see if you had new content. Reach is the number of people who actually see content either through an RSS reader or otherwiseâ€”like on a news aggregating website or an RSS search engine. The major feature-based drawback to Google Analytics has to do with the availability of the data. Google decides when reports are generated, not you, so information you see is usually from at least a few hours ago. But features aside, perhaps the biggest concerns people have about using this software have to do with privacy. If itâ€™s possible for you to do so, the best options will generally be programs that you host on your own Web server. Theyâ€™re the most reliable, most customizable, give you total control over your data (and ownership thereof), and wonâ€™t limit how many pageviews you can analyze like most of the hosted services. The downside to these is that they require access to your server and the technical knowhow to install, configure, and access the software yourself. If you feel comfortable going down this route, Piwikâ€™s website should be one of your first stops. Itâ€™s a very good, free, open-source program with a large base of developers behind it. It positions itself as the â€œopen source alternative to Google Analyticsâ€� and itâ€™s about as user friendly as this sort of thing can get. Other free server-based options include AWStats, SlimStat, and Webalizer, but while each of these has its own unique benefits, they are decidedly more difficult to use than Piwik. Hosted (where a company has the software on their server so you donâ€™t have to worry about installing it on yours) alternatives to Google are generally pay services or limited in the number of pageviews per day/month you can have analyzed. W3Counter, for example, has a good free service, but itâ€™s limited to 5,000 pageviews/day and youâ€™re required to display a small logo of theirs on each of your pages. The upgraded plan, which is currently $9.95/mo, removes the logo obligation and allows up to a million pageviews/month (among other features). As another option, StatCounterâ€™s free plan offers almost all of the features of the premium plans, which range from $9-$29/month, except for the amount of analysis it will perform, which is broken down into two levels. At the no-cost level, basic statistics are viewable for 250,000 pageviews/month, but detailed information is limited to the last 500 visitors. Both W3Counter and StatCounter offer real-time reporting. Almost all of these services have a demonstration page on its website for you to test drive the program before you sign-up or install it, so check out a few before deciding. ]]> http://citmedia.org/blog/2009/06/03/citizen-media-business-issues-web-statistics/feed/ 1 Investigative Blogger Raising Funds http://citmedia.org/blog/2009/04/23/investigative-blogger-raising-funds/ http://citmedia.org/blog/2009/04/23/investigative-blogger-raising-funds/#comments Thu, 23 Apr 2009 19:13:02 +0000 http://citmedia.org/blog/2009/04/23/investigative-blogger-raising-funds/ Firedoglake is raising money to pay for investigative blogging. Mediactive: Why media consumers, not just creators, need to be active users. ]]> Journalism and Location http://citmedia.org/blog/2009/04/15/journalism-and-location/ Wed, 15 Apr 2009 22:38:23 +0000 http://citmedia.org/blog/2009/04/15/journalism-and-location/ I’ll be speaking at the Where 2.0 conference next month in San Jose, about journalists are using, and can use, location-related products and services. The talk is called Where Does Journalism Go? ]]> ProPublica Invites the Public's Help http://citmedia.org/blog/2009/04/09/propublica-invites-the-publics-help/ http://citmedia.org/blog/2009/04/09/propublica-invites-the-publics-help/#comments Thu, 09 Apr 2009 16:19:07 +0000 http://citmedia.org/blog/2009/04/09/propublica-invites-the-publics-help/ ProPublica has launched the citizen-journalism portion of its operation, or at least the first iteration. By posting The Obama Teamâ€™s Disclosure Documents and asking readers to help figure out any potential conflicts of interest or other facts that are worth knowing, the site is doing what newspapers could have been doing years ago but haven’t bothered to do. This crowdsourcing follows key early journalistic adopters, notably Josh Marshall and his team at Talking Points Memo. Amanda Michel is leading ProPublica’s citizen component. This is a great start. ]]> http://citmedia.org/blog/2009/04/09/propublica-invites-the-publics-help/feed/ 1 Location, Location http://citmedia.org/blog/2009/04/06/location-location/ http://citmedia.org/blog/2009/04/06/location-location/#comments Mon, 06 Apr 2009 13:48:18 +0000 http://citmedia.org/blog/2009/04/06/location-location/ Combining mobility, time and location is becoming one of the most valuable techniques of media creation. Last week, some students and I did a small experiment that demonstrates how easy this is to do, and suggests all kinds of possibilities for journalistic follow-ups. What’s not noted here — or in most traditional media coverage of the meltdown — is something that everyone should understand. These profits were an illusion in the end. They existed just long enough, purely on paper but not in any long-term reality, to boost stock prices in these companies and to give executives the excuse to pay themselves extravagant salaries and bonuses and, if they were really smart, to unload their stock at high prices.